The U.S. might have gotten a boost in their quest for the Round of 16. Portugal's notoriously hot-headed defender Pepe was sent off for headbutting Germany's Thomas Muller in the 37th minute of a disastrous first half for the Portuguese. Germany jumped out to a 2-0 lead by the 32nd minute, first scoring with a penalty from Muller, who notched the first hat trick of this World Cup. Germany went on to win 4-0 and now the U.S. might be feeling a bit better about their chances of advancing out of the group. Depending on how things go against Ghana first. The confrontation between Pepe and Muller began when Pepe's hand connected with the Bayern Munich star's face as they were both chasing down the ball. As Muller sat on the ground holding his jaw, Pepe apparently became convinced that he was feigning injury, so he pushed his head into the downed German's. Because why use words when you can use your head as a ramming device? This prompted the referee to show Pepe a straight red, reducing Portugal to 10 men for the remainder of the match — an advantage Germany quickly capitalized on, scoring a third goal — Muller's second — just before halftime. 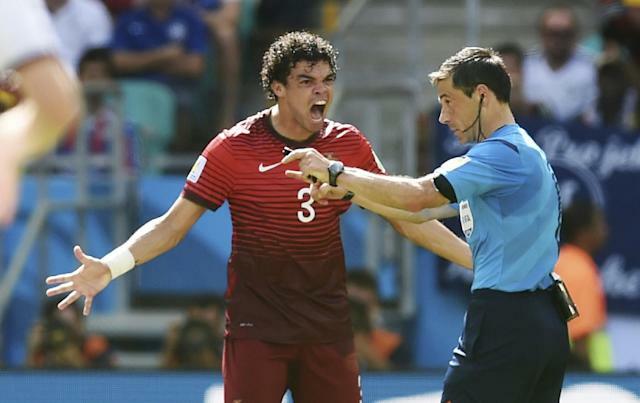 Not only did Pepe's temper worsen an already bad situation for Portugal in this match, but it also gave them a handicap for their next one against the United States, as he will be suspended for that match. This a major loss for their backline, but one that never seems too far away given Pepe's penchant for lashing out. In the second half, Portugal lost another key defender in Fabio Coentrao, who was stretchered off with an injury. Between this, the red card, and striker Hugo Almeida coming off with an injury in the 28th minute, Portugal were forced to use all three of their substitutes before the 70th minute. 2010 World Cup Golden Boot and Best Young Player Thomas Muller then completed his hat trick in the 78th minute with a tap-in to make it 4-0. Almeida and Coentrao were reportedly both ruled out for 10 days due to their respective injuries, which would prevent them from playing against the U.S. or Ghana. After all that worry about Cristiano Ronaldo's fitness coming into the tournament, he has proven to be the least of Portugal's problems.